Tenants at a Clwyd Alyn Housing Association extra care scheme in Wrexham were given energy saving advice recently thanks to a visit from one of the Association’s regeneration and development partners. Liz McCloskey, Senior Community Engagement Officer, and Nicki Sorton, Community Engagement Coordinator, from ENGIE called in to the Plas Telford extera care scheme in Acrefair recently to run an energy advice session for residents. “We’ve had some great feedback from tenants who really enjoyed the session and as well as bringing along recipe booklets and veggie packs for everyone to inspire them in making carrot and coriander soup, the ENGIE team also donated a slow cooker as a raffle prize which was won by Denise Borgstrom,” said Louise Blackwell Community Development Officer for Clwyd Alyn. 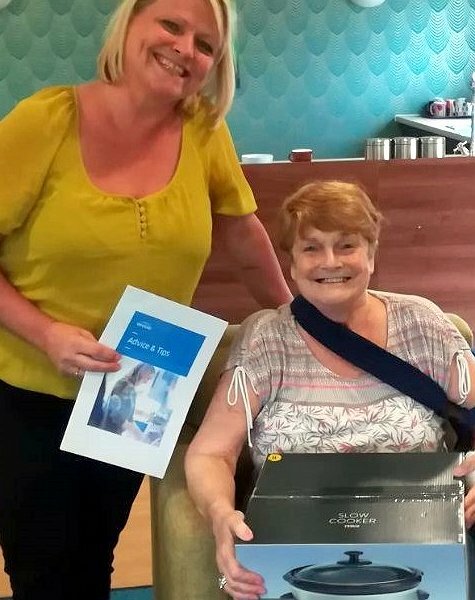 “We’d like thank the ENGIE team for providing a great session, and also thank Extra Care manager Yvonne Jones for her warm welcome and for helping with all the arrangements,” added Louise. "Housing repair Team boost play project"
"Cream tea treat honours caring Mum"